One more project from MoMA's Design and the Elastic Mind exhibition to enter into our archives and into a perpetual state of hypertextuality. 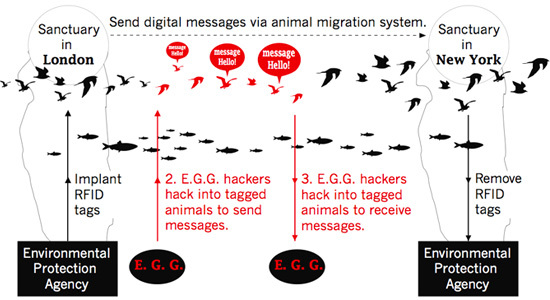 That project is the Animal Messaging Service, the first part of Michiko Nitta's three-part Extreme Green Guerrillas manual, the designer's final project at the Design Interaction Department, Royal College of Art, London. We are forced to face the reality on a daily basis that environmental damage is more advanced than experts predicted. As global warming becomes the top of almost every government’s agenda, recent trends have put pressure on world leaders to act immediately: for instance, forced recycling, carbon offsetting and a 10-year campaign to make environmentally friendly living fashionable. Are these efforts really improving the environment? Are these activities saving the Earth? Considering that her “project takes current green trends to the extreme,” Nitta's answer seems to be that our current efforts are not making a dent, hence the Animal Messaging Service. The A.M.S. 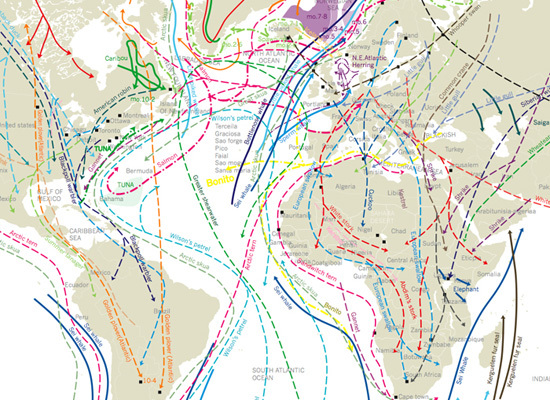 is an alternative form of communication whereby so-called extreme green guerrillas “send messages internationally by hacking into the animal migration system.” The environmental benefit of this is that it doesn't tie you to big corporations, as one would be if using the Internet and mobile phones, and unlike conventional postal systems, it doesn't leave a huge carbon footprint. 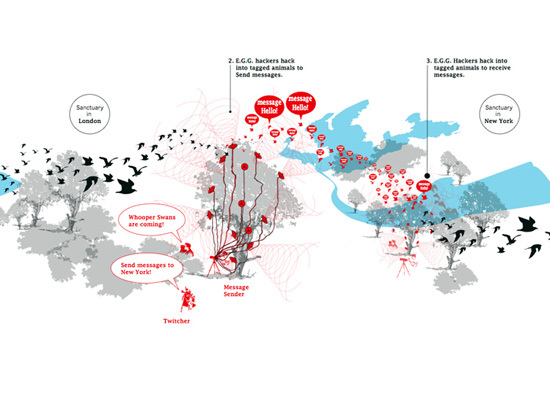 As but one of Nitta's scenarios, animated here in this flash animation for the Institute of Contemporary Arts, London, an EGG member relays his favorite recipe from London to New York by first hacking it into an RFID-tagged whooping swans as they pass through in April during their annual migration. These swans would then fly off, stopping along the way in Iceland. There, unbeknownst to them, the recipe would be hurriedly extracted, either automatically or with further hacking by camouflaged EGG members, who then waits for polar bears to transfer the electronic package into their embedded RFIDs. Amazingly, these bears can swim from ocean-locked Iceland to Greenland, where once again the recipe has to change hands, so to speak. “What is this recipe for?” we have to ask at this point; with this much effort put into getting it from one place to another, it must be for something spectacular. Well, whatever it is for, the last leg of its journey to New York will be undertaken by RFID-tagged salmons. Salmons? Hmm. In any case, there is also a local version of this service using RFID-tagged pets and visitor animals. One wonders if instead of hacking into an inorganic apparatus, you actually hack into the animal's biological systems. 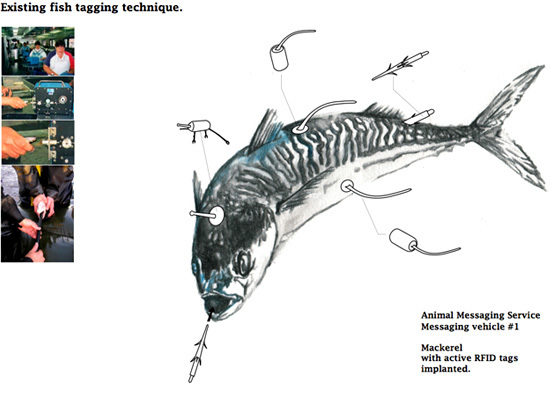 Instead of uploading the data into an RFID, the sender imprints the message into the animal's behavior, so that rather than downloading electronic bits of information, the receiver decodes the recipe from the subtle wiggling of salmons as they head upstream. To find out how much organic and locally grown basil in the solar roasted Piguail, a very close reading of the landscape is needed. Did that tail fluster or did it flutter? You'll need to brush up on hermeneutics. You head out to Central Park to read an endearing note from your pen pal across the oceans through the murmurings of millions of starlings. Bird watching will never be the same. The next day, you take the few flights of stairs to your rooftop garden or your neighbor's to watch honeybees waggle dance the time and place of your best friend's birthday party. Of course, without RFIDs, one would need to provide a mechanism in which the information can jump between species. This again could be done by hacking each conscripted carrier, either genetically or behaviorally or both, to enable direct interspecies communication. 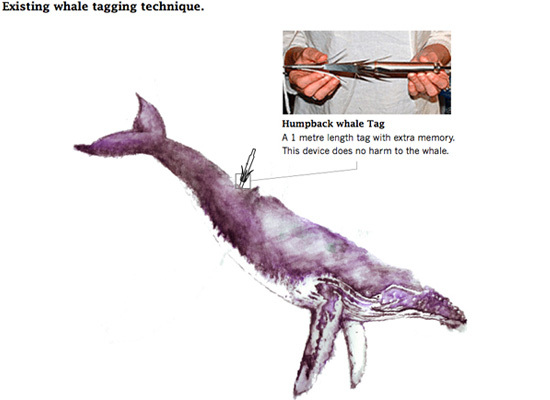 For instance, a love letter translated into a humpback whale's song that starlings can understand and then transliterated into elaborate aerial maneuvers. There might be a chance that the love letter gets garbled along the way into a message of hate, in which case, that is the price you pay for really saving the planet. But as always, our overriding interest here would be the effects of an Animal Messaging Service on the built environment. What if everyone, to the ultimately surprise of Michiko Nitta, fully subscribes to her vision of the extreme green lifestyle and cities everywhere adopt the A.M.S. as the default mode of communication? What then would the physical form of the city be like if its networked infrastructure is based primarily on zoology? Is this where “vegi.tecture” reaches its true potential? 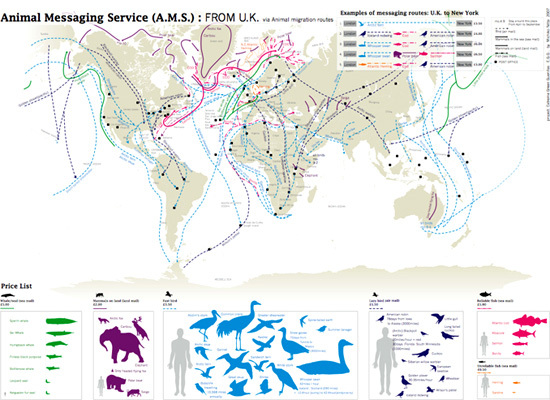 And how does one site these “natural sanctuaries” as data ports into the spatial grid? Are we going to look back again to Frederick Law Olmsted's Emerald Necklaces for our model? Or could there be a new landscape paradigm, one that is formed and informed by aberrant interspecies interaction; the threat of Avian flu; increasingly depleted natural resources; climate change; and the growing possibility that geoengineering may just be our best chance to counteract global warming? For answers to those questions, you will most assuredly not find any in this article, but you will read about some interesting facts about a massive government-sponsored faunal surveillance system designed to track the food supply of the U.S. by tagging livestock, poultry and other animals with RFID.